RadPieChartView is one of the RadChartView types. This chart visualizes its data points using radial coordinate system. 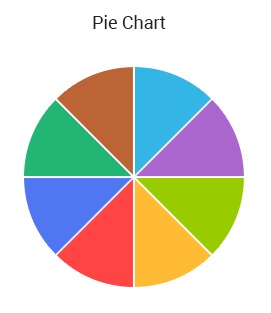 Each data point is represented as a slice from a pie. The ratio between the space consumed by each slice and the space consumed by the whole chart is the same as the ratio between the value of the data point that it represents and the total value of all data points in the series. DoughnutSeries: The DoughnutSeries extend PieSeries. When the RadPieChartView visualizes the data from DoughnutSeries, it leaves a blank segment in the center.